Essay-writing services are reporting a sharp increase in demand from overseas students at UK universities. UKEssays.com says it has had a threefold increase in overseas students buying university essays - representing almost half of its customers. 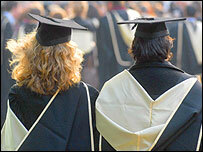 Universities have accused essay writing firms of fuelling plagiarism. But a spokesman for UKEssays.com says the rise in demand is caused by universities recruiting students with inadequate English language skills. "It's another example of universities turning into businesses. They're happy to get the fees from overseas students - but they don't provide enough language support," says Jed Hallam, spokesman for the essay-writing firm. Last year, the online essay firm says it had had 1,683 overseas customers - and already this year, in January and February, it has sold essays to 725 overseas students, three times the corresponding level of last year. Mr Hallam says overseas students have paid high levels of fees and feel under great pressure to get a good degree - but find themselves struggling with written English. As such they seek help from essay writing services, he says, with some students buying essays throughout their time in UK universities. Mr Hallam claims that "one Chinese customer, who is sent an allowance over from his family, spends the majority" on essay services. There have been cases where students have had difficulty even understanding the question they have been set, he says, let alone being able to produce a degree-level written answer. The essay-writing firm accuses universities of turning a blind eye to the problem of overseas students with poor written English - with financial pressure overcoming any academic doubts. Essay writing services provide custom-written essays for undergraduate and postgraduate courses. Charges range from £120 for an undergraduate essay written in five days to £3,200 for a 10,000-word postgraduate dissertation. They say that they provide model answers and study aids, which students should not attempt to copy or submit as their own. But universities accuse them of selling essays that are used dishonestly by students - and that students caught submitting such essays run the risk of not being awarded degrees. About one in seven students in UK universities are from overseas - about 330,000 students who bring in an estimated £10bn each year. And it warns of the damage that can be caused by the mis-use of "online essay mills". "Plagiarism devalues the efforts of students who work hard to achieve their degrees. It also damages the student who commits plagiarism, as they will not benefit from the research and learning experience," says a spokesman. "Universities UK members have severe penalties for those students caught cheating." I am a final year undergraduate studying business, a discipline with a high proportion of overseas students. I have worked in many groups with overseas students and the majority of these experiences have been negative, with a startlingly low level of verbal and written competency in English prevalent. How many of them pass each year is a mystery, and despite their commendable perseverance, with many examples to the contrary, the presence of these students acts to the detriment of English speaking students. As someone with teaching responsibilities at a prestigious UK university, I have found recently that significant numbers of overseas students (almost all Chinese) have been admitted with language abilities that fall dramatically short of the English test scores submitted with their applications, to the point that they can barely communicate. There is a widely held suspicion that these students have paid someone else to take the test for them. However, I do not have the authority to make these students to re-take their language tests, nor is it likely that they would be removed if they failed (no procedures are in place to deal with this). I spend far too much time trying to teach students who simply cannot understand a word I am saying (even though I speak slowly, using clear, standard English). It is very stressful! This problem seems to be especially severe for one-year taught Masters courses, for some reason. P.S. Of course, we do have many Chinese students who can speak ! English sufficiently well! It is the growing minority who cannot that I am concerned about. I am an overseas student (American) doing a PhD at the University of Bristol. I share a flat with other postgraduate students, all from overseas, mostly China and southeast Asia. All struggle seriously with English. As a native English speaker and someone doing a Literature degree, I have an above-average command of the Language and often help my flatmates with grammar and proofreading. Several of them write at about the level of a 10-year-old native speaker. This is not adequate for university-level work, and the emotional pain they endure as a result of daily feelings of inadequacy is heart-wrenching to watch. I saw this regularly while at university. I graduated last year, and I felt that throughout my 3 years at university I was expected to carry the overseas students through their studies. I'm not saying that all overseas students are bad students, far from it. Some of them had excellent English language skills. But far too many of them little to no written English skills, and very basic spoken English. It was common knowledge amongst us students that our university overlooked their English exam results, or lack of, as they got an extra £5000 by taking an overseas student over an student from the United Kingdom. I often found myself in a group of 5 or 6 people for group coursework, where I was the only person with English as a first language. As a result I found myself having to edit everyone's work, and do much of the research myself as everyone else would just sit around, not knowing what to do as they didn't understand what the lecturer had told them. Well, I'm a senior lecturer at Queen Mary, University of London. We have lots of overseas students. I only know about my department, but I can say that we do not admit overseas students lacking English qualifications, we don't dumb things down for overseas students with poor English (some do seem to have worse English than would be suggested by their qualifications) and we deal with plagiarisers very severely. Regarding essay writing services, if they really are only providing model answers that they don't expect to be plagiarised, then they should be happy to provide copies of all their essays to Turnitin, the online anti-plagiarism service that a lot of UK Universities use. If they aren't happy to do this then the obvious explanation is that they are lying about what they expect their products to be used for. I'm currently a 2nd year studying Economics. There's a large proportion of foreign students on my course. It can cause problems in several ways, the most notable is in tutorials where we do group work for example. Some of them cannot contribute and it is often left to other students to carry them in these situations. I don't however think this is the students' fault, I am angry at the universities for taking them on. Everyone knows that however they sugar coat it they get thousands more in fees from a foreign student than a UK student. Buying and using ghost-written essays is already a part of the academic culture all English-speaking countires. To just focus on foreign students' efforts to use the service of essay companies is to diminish the significance of the problem. The question is why should there be companies that make a living writing essays for sale? Such companies are still likely to more than break even if there are no foreign students. To make students -- foreign or national -- do the work that forms a basis for their degrees, all essay-writing companies should be made to make all copies of their essays available to the turnitin site, to make it easy for teachers to check for plagiarism. UK universities for too long have adopted a "take the money and run" attitude to foreign students. At the lowest level this is admitting foreign students at the undergraduate level who do not have a strong enough grasp of English. At the upper end it is outrageous neglect of doctoral students, supervisors being so lazy that they don't read a chapter for 5 months or more. Foreign students just shouldn't attend UK universities. The services are simply too poor. Plagiarism is rampant amongst British students - and has been for a long time. I did my undergrad and PhD here as a foreign student, and many of my colleagues were plagiarising in their undergraduate essays and some were having their masters and PhDs written by others. This is a very serious issue and one that could totally undermine all higher education in the UK. As someone who has worked in British universities for 30 years, I cannot support the view that our universities are happy to take students' money and run. Far from it, they do provide students with a great deal of support (far more than students of my generation received in the 1970s when I was one). I feel that British universities have been naive in defending themselves against a variety of forms of cheating. Many contributors note the poor quality of English of many foreign students. Yet, I fear that just as there is a market for plagiarized essays, there is a market for forged English qualifications. I have no other way of explaining how students with strong qualifications prove unable to communicate or write in proper English. Second, I fear that where plagiarism is established, many UK universities are timid in the extreme in applying the sanctions that they have at their disposal, often restricting themselves to token or insufficient punishments. It is my view that plagiarism is cheating and should attract the most severe penalties. Unless strong action is taken, I fear that the very quality that foreign students look for in UK education will be eroded - the integrity of the degrees. I totally agree with the take the money and run allegation.I study in the Uni of Bristol and find ironically a lot of Chinese students in Economics(written based) and very few in the course I do (Maths). Also many of them don't have the adequate conversational skills and certainly not the witten skills. And just for the record, I am a an overseas student from a country where English is not a first language but it is one of a few languages in my home. I think unis take the money and run away.I am also very disappointed in the lack of financial support,the food is not subsidised,rent is rocket high, tuition fees are absurdly proposterous as well as severe lack of reinvestment in infrastructure. How the hell can these Chinese students not cheat? When you are charged more than £10,000 a year in tuition fees alone, failure is just not an option, "by any means necessary" becomes the order of the day! I know many of my counterparts especially from the Middle East have no problem paying upto £500 for a piece of course work....Blame the examiners for not spotting them. Putting all the blames on overseas students are just not the right way. As an international student myself, I admit that there are some overseas students who do not have the adequate level of English to deal with university work. However, most of the time, overseas students put in more effort and time than home students for a similar piece of work to get similar results because of language disadvantage. Moreover, having to cope with emotional pain due to language deficiency and not being appreciated in group work makes their university life in UK worse. After all, having charged overseas students with tuition fee as high as £13,000 per year, the university as a higher education institution should at least employ some system e.g. Oxbridge tutorial system as mentioned by Dr. Andrew Edmonds to cope with plagiarism. Having spent over 14 years as a teacher of English as a Foreign Language, I too am depressed about the extent to which Educational Institutions in English-speaking countries are taking a narrowly business-centred approach to marketing courses for non-native speakers. The latest - not to put too fine a point on it - 'scams' are 'out-sourcing' University courses with a guarentee -regardless of real performance - of a place in the home university's undergraduate programme. Co-existent with this trend is the increasing effort Universities put into 'Bridging Programmes' where, after a derisory few terms of supposedly 'intensive' English, those who merit the description 'Modest User' (or worse!) are magically transformed into students competent enough to present 3-5,000 word assignments! It's ALL about "Show me the money!" and has NOTHING to do with a concern for equipping students with the language skills that they need. As a mature student for the last two years it is noticeable how many overseas students there now are compared with my first degree days and the extent to which "dumbing down" occurs to allow for them. Many can barely speak English and typically are divided amongst home student groups for group work so that their lack of contribution can go unreported. The more you look at British education the more full of holes you see. The reality is that there are far far too many home and overseas students who should NOT be there. At the end of the day it is a waste of everybody's time and money. I am currently studying for a law course in London and there are strong and frequent rumours that overseas students 'get others to do their work for them'. There are a few students, mostly from south Asia, whose English is really a barrier to success - and for the advocacy assessments in particular there is no way that they can disguise this. Plagiarism or other forms of cheating are never acceptable but questions should also be asked of the schools that put these students into this difficult position. Colleges should, indeed MUST, test the English language ability of applicants in order to avoid the students wasting their money and impacting the learning of their classmates. I have no evidence of any cheating actually taking place, and I do not suggest that it is - but it is clear that there are quite a few on my course whose English is well below par and this must certainly lead to temptation. I am currently studying a Law degree and there are a large number of international students on my course who cannot speak basic English. I often find new and difficult legal terms when reading and in lectures, so I cannot begin to imagine how these students who cannot speak basic English can comprehend the lectures and text books. Yet there are a great deal of international students in the final year, so they must have passed the essays and exams. But my question is how? If native English speakers find Law a challenging subject how are people who don't speak English passing? I study in this country for four years and finished with my doctorate and been in three top universities in UK. This report is a spin to cover the backwardness of British youths. When I was in university, just last year, British students are most likely to copy, plagiarize and copy essays from all those dubious websites for money paying business and shenangians.The country unfortunately, I found out, thrives in passing buck and blaming other ethnic groups and nationalities for their woes. In football, politics, good governance and NHS. It's sheer hypocrisy on the part of the universities. They're keen enough to shunt anybody through the system if they can extract money from them; then they think they have the right to come over all precious about their 'academic standards' and the iniquity of plagiarism. What do they expect these substandard students to do? If the students aren't good enough, they can either cheat or fail - and the universities can't afford to start failing them. Because that would queer their lucrative source of income - and they'd far rather queer their academic standards and keep the till ringing. As a former English teacher and someone who has lived abroad I can understand the concerns of people who have posted here, but would like to clarify for those who are not familiar with English language learning. (ii) they come from a country where there is a little in the way of speaking practice. I used to teach in China and know for a fact that with honest students there can be an enormous gap between their ability to read/write and speak/listen. You must remember that English is not entirely phonetic, so just because a student knows a word doesn't mean that they can understand it when it is said to them at native speed or pronounce it correctly. IELTS exams are quite predictable so students can have coaching to improve scores in oral exams. They can also take the exam as many times as they like. They only need to get the magic 6, 6.5 or 7 once. 2. IELTS levels are pass marks, but too many students are content with the pass mark. Once they have the 6.5 or 7 they need, they consider that sufficient, rather than aim to improve it. 3. Language support varies from university to university. I think it is unfair to simply label all universities as simply taking the money. Imagine the outcry if they start saying that just having the certificate isn't enough. They need to be able to predict student numbers. 4. Plagiarism rates in some countries are horrific (when I was in China I had plagiarism rates of 80% plus as a minimum) but the idea that British students are somehow blameless is ridiculous. This makes me so angry, when I see my own daughter working into the early hours on her essays at Manchester Uni. I think these essay writing firms should be made illegal. I certainly think essay writing sites are unethical, but I really wish I could never hear again the phrase 'x' or 'y' should be 'made illegal', as suggested by Joanna of Twickenham. Every new law is a freedom removed. I'm a visiting fellow at the university of Buckingham, which has a very high proportion of foreign students. They use the Oxbridge tutorial system, which means that the lecturers all know the students well, and written work of dramatically different capablities to their oral skills would soon be spotted. There are also technological solutions to plagiarism, which can detect if work is copied off the internet and might be used to detect differences in style. I work as a researcher at a relatively prestigious University Department where most of the students are foreign (I have not quoted the city here, for obvious reasons). The Department is happy to take their money and allocate disproportionately few lecturers or unsuitable supervisors to them. Why? Because these students are recruited to provide a justification (as a teaching institution) for the employment of most of the other lecturers, who have no teaching purpose but are here to bring in RAE money (=governmental funding for research). The fact that some foreign students cannot cope does not necessarily have to do, as many have stereotyped here, with their intellectual ability. Apart from unsuitable or inadequate academic support, the cultural barrier is also bigger than you think, which the University itself imposes on them with the "international student" label, already at the stage of applying. And language difficulty does not mean intellectual weakness (which indicates some covert discrimination in this forum)! Moreover, lecturers who are trying to help these students (linguistically, academically) are chastised by their superiors and are instructed to neglect them, in order to concentrate on the RAE (i.e. produce publications) and therefore keep their jobs. After a few years, Higher Education in the UK will see a slump of overseas recruitment, when these people assert their rights to educational resources worthy of their fees. Then the UK Educational establishment might reconsider how it treats its customers, wherever they come from, but the damage to its reputation will have been done. We have one of the highest proportions of foreign students of any UK university, and of those that I have spoken to or worked alongside, the levels of conversational and written English are generally really poor. I would wholeheartedly agree with the point made elsewhere that often they are not only incapable of answering the questions properly, but often of even understanding them. Last year I was asked by an Italian student, about an hour before a deadline, to have a look over his work and see what I thought of it. He had utterly missed the point of the assignment, and submitted something completely different and about one tenth of the length. This is unfortunately not a one-off incident, but an illustration of the total lack of comprehension most foreign students seem to possess. Plagiarism is by no means limited to overseas students. I am a PhD student who teaches undergraduate classes, and last week I marked a piece of work from a final year British student that was at least 50% plagiarised from a single book. This was by no means the first time I have encountered something like this, either. Many claim that they don't understand what constitutes plagiarism, but by the third year in higher education, that excuse becomes somewhat tired. As a visiting lecturer at postgraduate level, I agree mostly with Rob Knell's comments. However, where I teach, a small proportion of overseas students clearly have quite inadequate language skills to cope with the courses. The university does provide quite extensive language support, but the impact is very patchy. This inevitably interferes with the learning experience of other students.